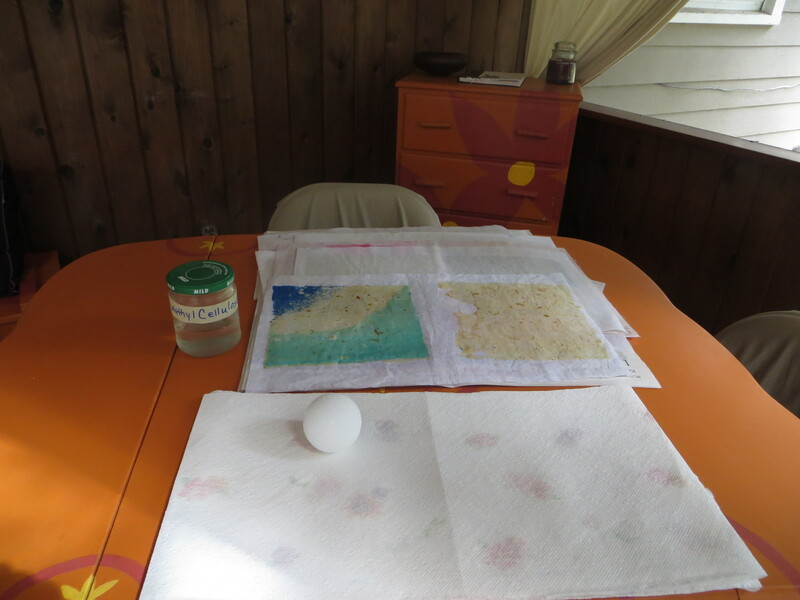 How lucky for me that Kathy had so much extra pulp she organized another papermaking open studio! I was hooked after the first five minutes of the Wednesday session and was thrilled when I got the email about another opportunity. Kathy gave me the green light to work independently and I even demonstrated a couple of “how to’s” for the other participants. I didn’t waste any time and started adding color after I completed a few practice base sheets. One of the lovely ladies, Laura, brought beautiful pressed leaves to share. I would have never thought about incorporating additional elements into the process. (Now my mind is racing.) The flecks of marigold disbursed against the green and I was delighted with the way the leaf made its signature on the page. While we worked I asked Kathy about other uses for the paper in art, specifically about how to use it in making sculptures. “How do you get the paper to stick? Do you wet it?” I asked. 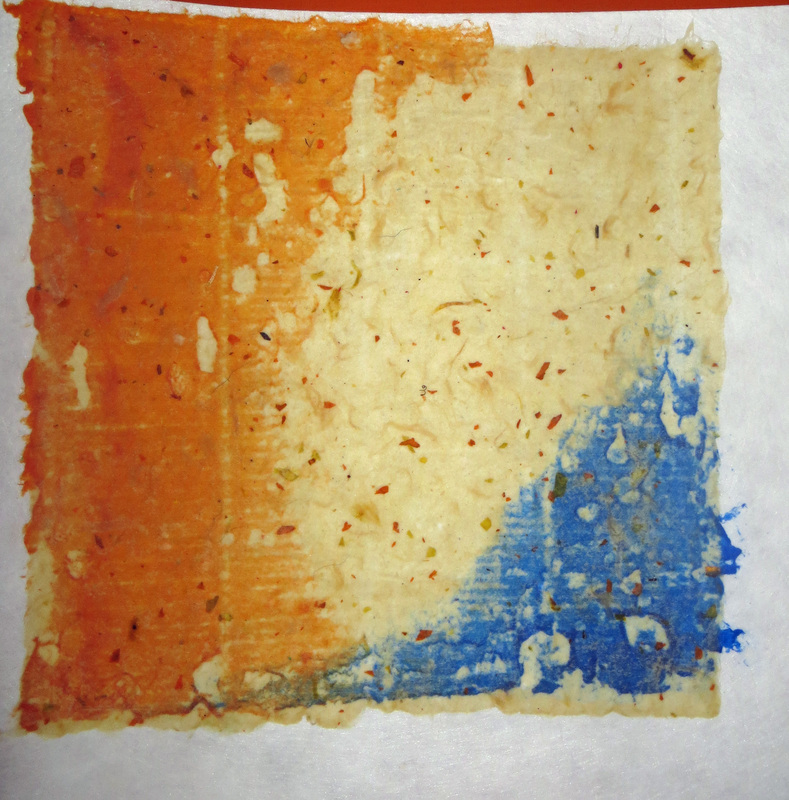 “You can, however I find it best to work with the paper before it dries. That way it just sticks to the object and as you can see, it’s really quite beautiful. You can also brush a layer of Methyl Cellulose over the top to help it adhere,” she said. 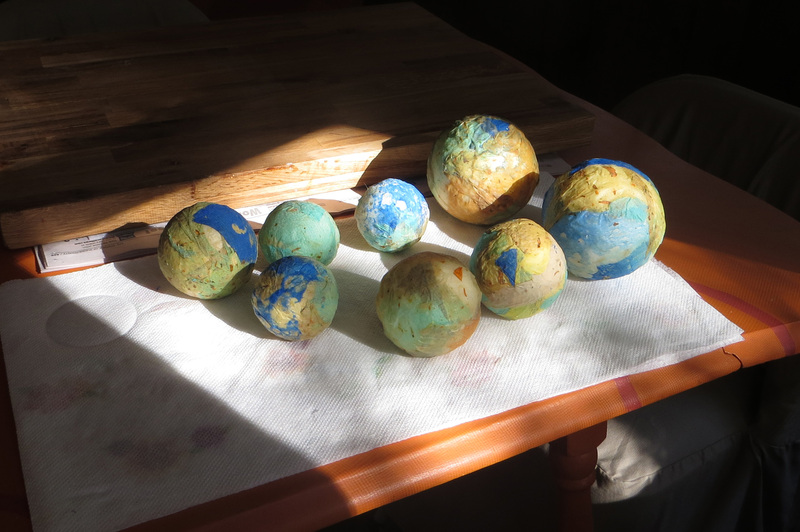 I bought eight Styrofoam balls and some of the mysterious clear liquid, Methyl Cellulose. Exhausted but invigorated, I followed Kathy’s instructions to take a break before I started into the creative process. I couldn’t sit still long. The stack of freshly made paper and the bag of Styrofoam balls were calling my name. I pulled the protective material away from the first two sheets and stared at my blank canvas. 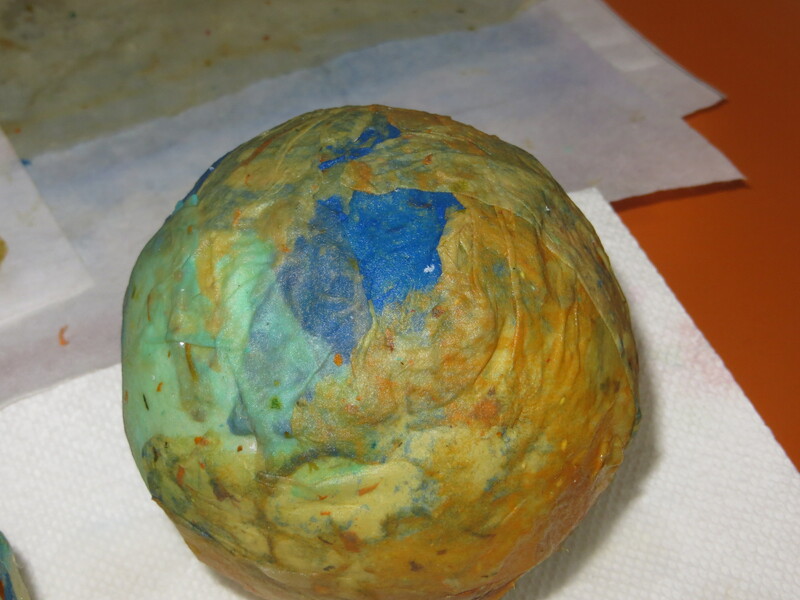 I peeled up the first sheet, tore off the bright blue corner, and placed it on the ball. As promised, the sticky wet paper was strong enough to handle. Colors and designs emerged as I gained confidence and embraced doing something new. 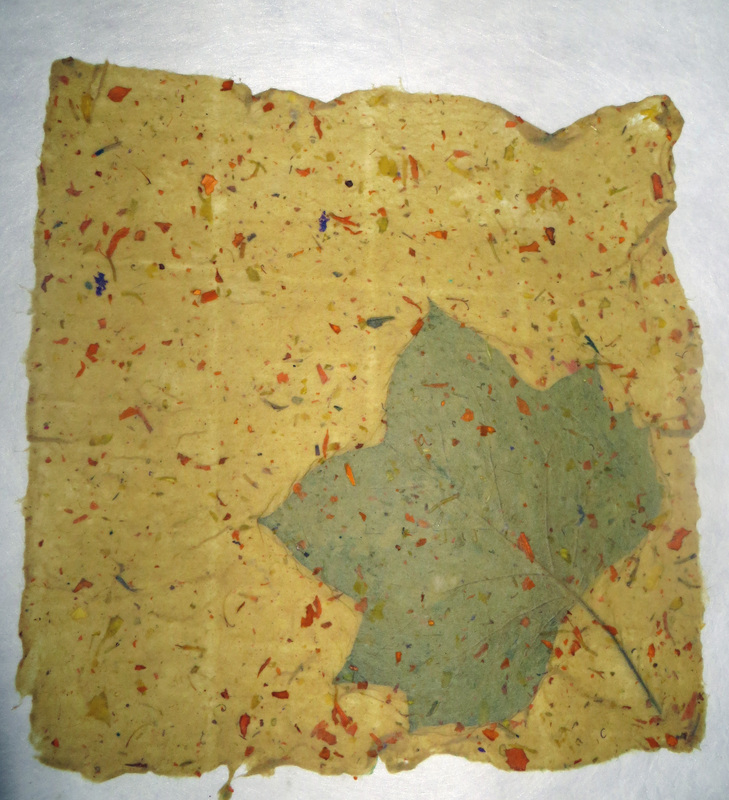 I stopped to admire the way the shades of green, blue, and orange blended into the natural tannish color of the paper. The flecks of orange somehow found their perfect placement around the curved shape. 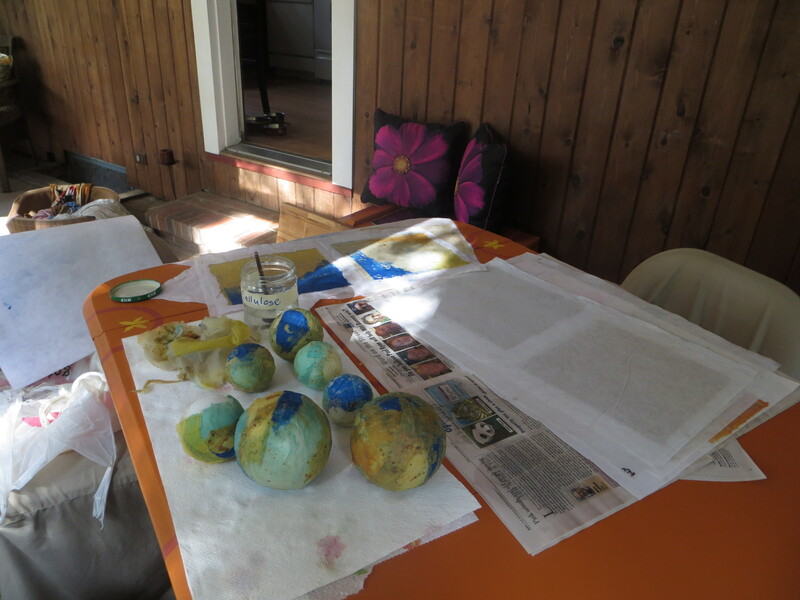 My porch makes a perfect playroom for an artist. The bright pink petals against the orange background of the table and hand me down chests is cheery and inspiring. Enya is my Pandora station of choice. The dogs roam between the kitchen and the backyard and amuse me with their snores and snorts when they curl up to take a nap. 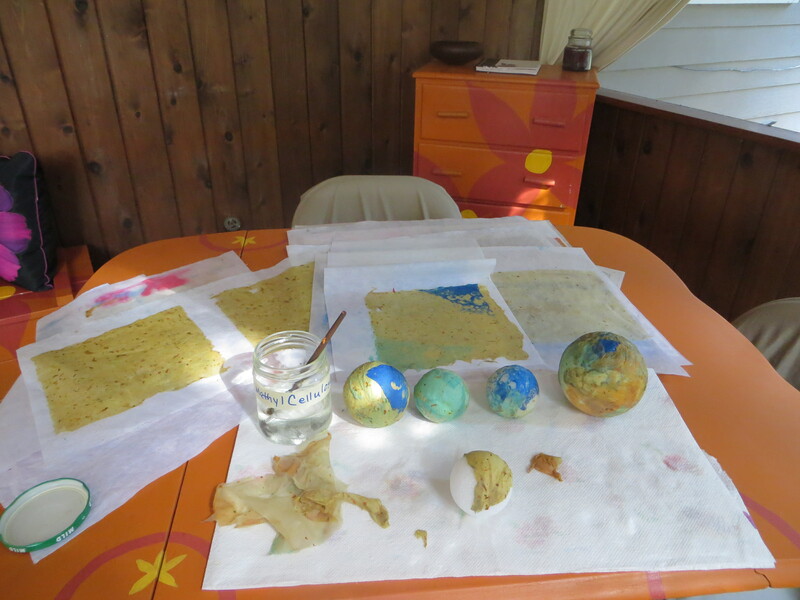 The finished project was more than a lesson in papermaking and creating a tiny universe out of Styrofoam balls. It reinforced that it’s wonderful, albeit sometimes a little scary, to try on something new for size. I can’t help but compare it to the first day of my drawing class last January. I was nothing short of petrified and it took me more than six months before I attempted to create anything without specific and hands on guidance. If it hadn’t been for the instructor I’d have quit after the first class. It’s been a hard lesson to learn, but I now know that my art doesn’t have to be perfect and half the fun is trying. The perfection of a masterpiece lies in the imperfection of mistakes made and lessons learned as it was created. I think it could be said, that being perfectly imperfect applies to a whole lot more than art. It occurred to me there’s a theme here, a connection to your writing… making paper, making book covers, building blocks to your book. I love it! 🙂 great observation Steve!